Hummingbirds seek out shrubs and perennials with bright flowers. Hummingbirds have no sense of smell. The only way they know flowers are near is if they see them. 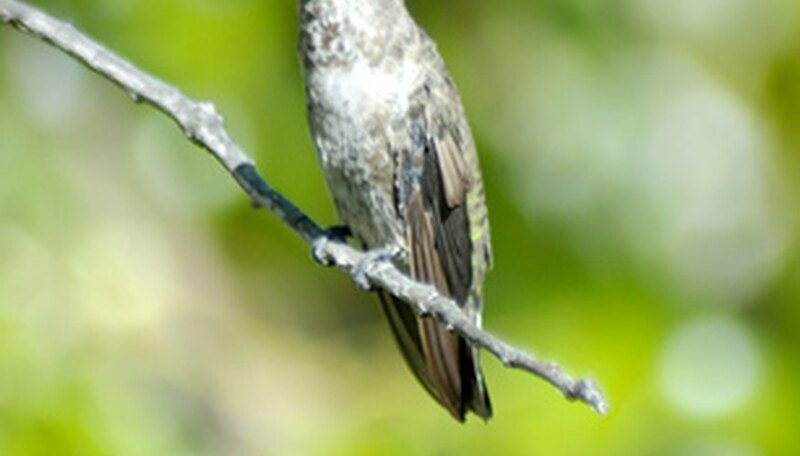 Hummingbirds expend a lot of energy, and they need to feed on nectar almost constantly. The plants go out of their way to produce flowers that will attract hummingbirds because they need the birds to help in pollination. It is a win-win situation for both species. Beebalm (Monarda fistulosa L.) is also known as wild bergamot. The plant is a perennial that produces lavender, pink or white flowers that grow in clusters from May through September and fragrant leaves that are used to make mint tea. It will grow from 3 to 6 feet tall and from 1 to 3 feet wide. Beebalm grows in zones 5 through 8, which includes southern Canada and most of the contiguous states, with the exception of Florida. The plant likes full sun or partial shade and a wide range of soil types as long as it is moist to dry. It attracts butterflies as well as birds. Cardinal flower (Lobelia cardinalis) is a perennial that grows in clumps from 1 to 3 feet wide. The plant produces purple leaves and bright red flowers. It likes full sun and partial shade and needs soil that is moist, but not wet. It can survive a flood, but not a drought. Cardinal flower is hardy in all of the contiguous states and in southern Canada, and it is a favorite of the ruby-throated hummingbird. Firebush (Hamelia patens) is also known as scarlet bush and hummingbird bush. It is an evergreen shrub that grows up to 15 feet tall and produces 6-inch long bright green leaves and small red-orange or scarlet colored flowers that grow in clusters on red colored stems. It produces berries that start out green and turn to yellow, red and then black, usually at the same time as the flowers bloom. The plant is at its best in full sun, but it can do well in partial shade. The soil should be moist and well drained. It is hardy in the warmer zones, 8 to 11, including the deep South and Hawaii. Hummingbirds will come for the flowers, and other species of birds will come for the fruit. Bottlebrush (Callistemon citrinus) is also known as lemon bottlebrush and crimson bottlebrush. It is an evergreen shrub that grows from 6 to 12 feet tall and 6 to 9 feet wide. It produces thin leaves that have a citrus aroma and bright red fuzzy flowers that grow in clusters and bloom in spring and summer. The plant likes a well-drained, sandy soil and full sun. It grows in the hottest zones, from central Florida south.